ONLY 6 LEFT IN STOCK!!! This is a brand new, officially-licensed, 22 1/2" X 34" poster of John Lennon wearing a jacket from his famous New York City photo shoot. 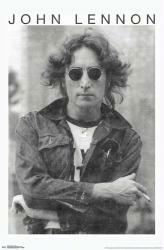 The poster is entitled "John Lennon: Smoke."